I’ve been known of late to use and abuse the word ‘awesome’, though once I would have shunned it. But ‘awesome’ is the only word to describe the fantastic ‘surprise course’ at Trail of Our Bread on Saturday. A work of sugarcraft art – but how did it taste? We’ve been to this supperclub before to review, then were gutted to miss out on the Ocean Commotion evening. We saw some familiar faces when we arrived and I’ll bet they’ll write more complete accounts of what we ate – it was my night-before birthday celebration so I was glad to have any photos come out at all. We started with chestnut and chorizo soup, laden with caramelised onions. I could have eaten bucketloads (classy, me). Seconds were offered but previous supperclub experience finally came to bear and I (uncharacteristically) restrained myself, ostensibly in order to enjoy each and every course. Realistically, so that I wouldn’t need to be rolled out. 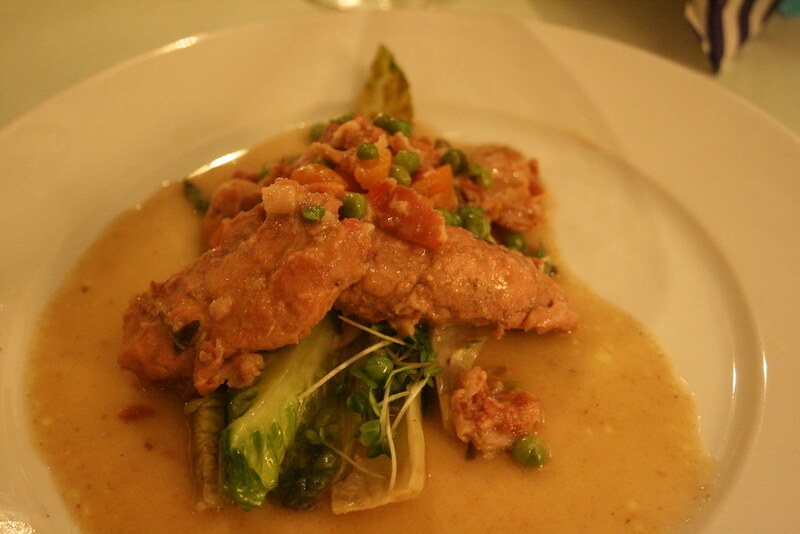 The main course was (Easter) bunny which again was something I’ve never cooked – or eaten for that matter. I was treated to two saddles, though I was assured that the meat on the bone was just as flavoursome. Thanks to a surprisingly good bottle of Chapel Down and a decent Cabernet Sauvignon that we were making our way through, I’m a touch cloudy about the exact order in which the next courses arrived. There was the wibbly but tasty experimental citrus jelly, the set and ludicrously moreish Absinthe jelly, and then Jim, our host, made an announcement. For the duration of the evening, a surprise had been hidden in plain view, right beside me. Jim knew that it was my birthday and he suggested making a cake – which Anna baked and decorated from scratch (she asked the boyfriend “What does she like?” “Meringues.” “Sod that, I’m not making a meringue”). It was a layered sponge with buttercream, jam and fondant. 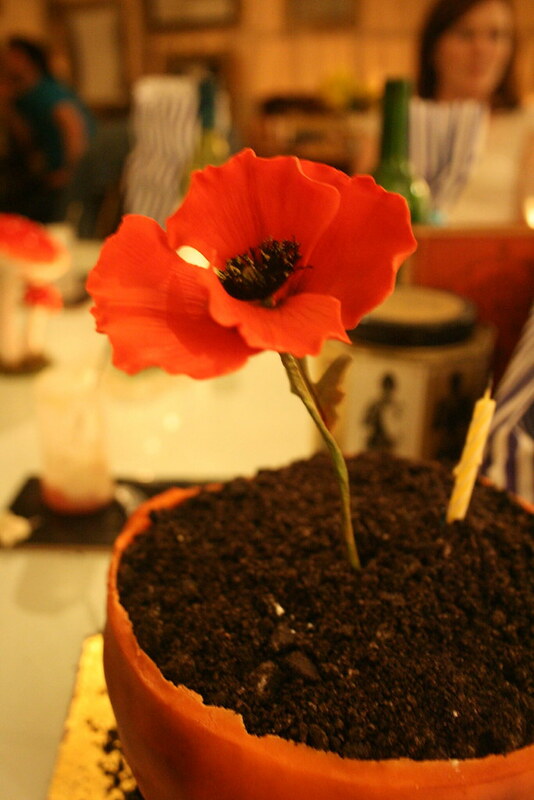 The sugarcrafted poppy was fab, and the touch of genius was using crushed Oreos for the soil. You paused before taking a mouthful, it was so fantastically realistic. 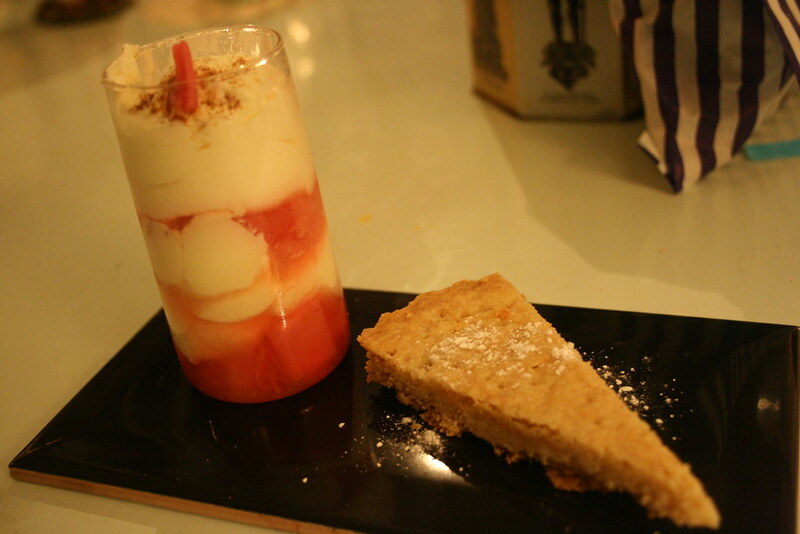 You never know quite what you’ll get at a supper club. This time around we had lots of new things to try (for me, rabbit and absinthe included) and shared our table with a great bunch of girls and the odd wildcard. Group photos aren’t the norm but we had those too. The set dressing – including Alice in Wonderland style TOOB goodiebags – was imaginative and sparked conversation, including whether we really should ‘Drink Me’ or not, when faced with little cork-stoppered bottles filled with what might have been absinthe or Fairy Liquid (vodka with colouring). 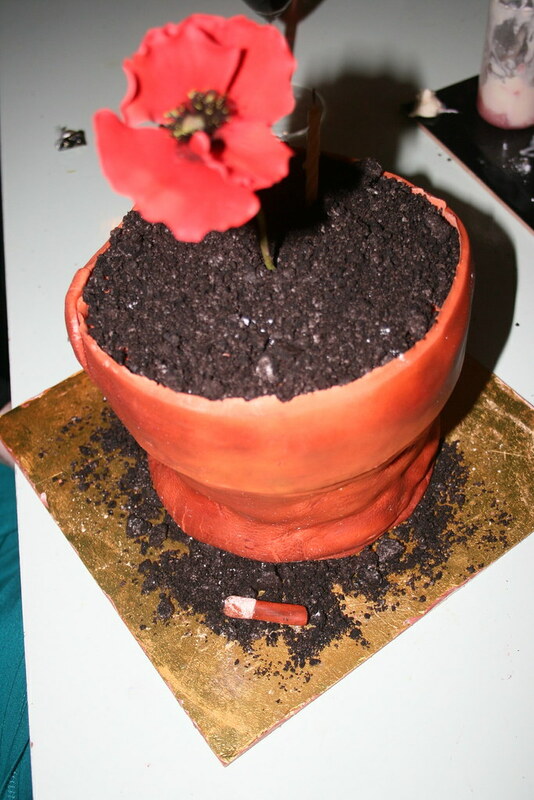 Thank you so much to Jim and Anna for making it such a fun night, and especially for the awesome flower pot – and yes, it did taste as good as it looked! 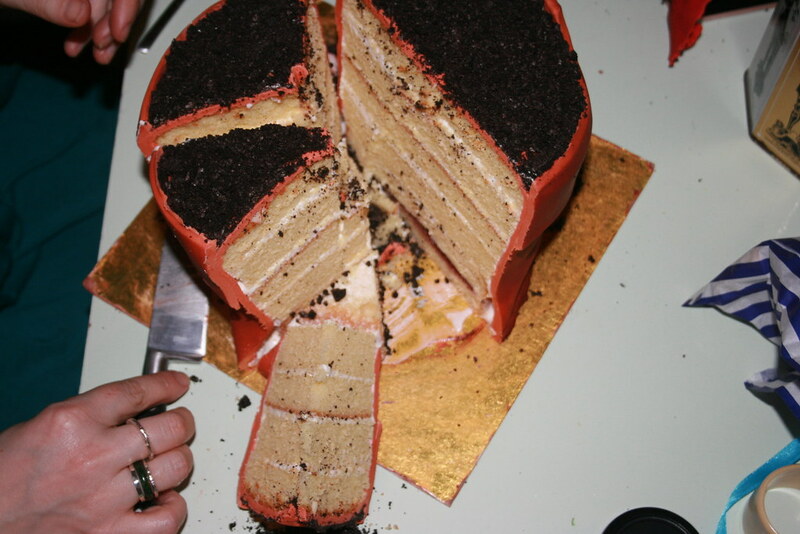 That’s definitely out of the ordinary for novelty cakes – and hell, anyone who knows me know how fussy I am about baked goods. Anyone need a bespoke cake for an event? I recommend you contact and try to cajole her. It was a stolen day today – our plans for museum visiting and tea with friends were foiled by unforseen work commitments. Not ours. So we were left with an entirely free agenda. Naturally we decided to fill it with food. First up, a wander through Victoria Park in blazing sunshine, coupled with cold noses from near zero temperatures. Then veering off through not-so picturesque industrial estates and along darkened underpasses: all to find the Counter Cafe. 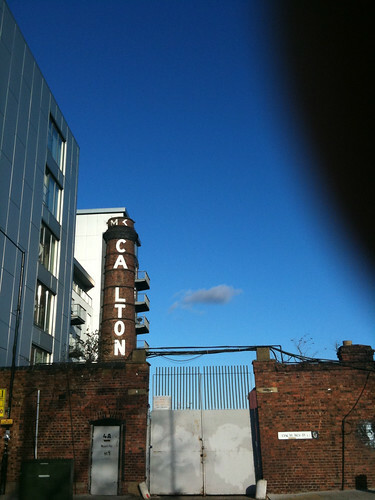 When you see the Ca_lton tower, you’re there. It’s a brunch menu, served throughout the day. Two super-smooth lattes to start with, complete with the obligatory antipodean feathered milk tattoo. We chose the Big Breakfast and the French Toast and berries with a side of bacon. Salty and sweet rules my world. The Big Breakfast includes skinny sausages, fat slices of lean bacon, sunshine yellow fried eggs on wholewheat toast. Along with crispy homemade potato cakes, homemade butter beans in tomato sauce and superb tomato relish (available in jars to take away). 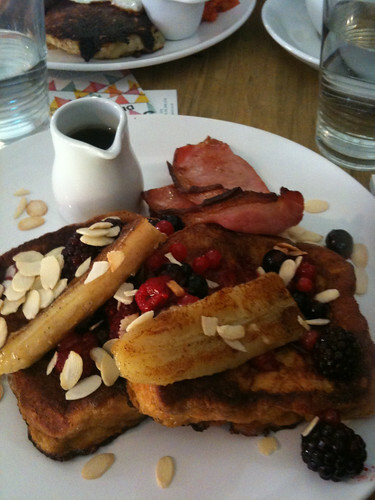 The French toast – thick square slabs of golden goodness and fried bananas, scattered with sharp berries and flaked toasted almonds and the obligatory miniature jug of maple syrup for pouring. The crowd is mixed – Guardian-reading couples, friends gossiping over coffee, walkers fresh from the Capital Ring tucking into substantial breakfasts. They consciously try to use organic ingredients where possible. Interestingly, less families than the often overrun Pavilion in Victoria Park, another local favourite. 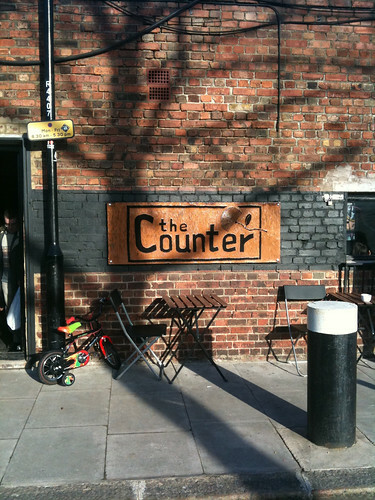 I’d quite like to potter down to the Counter Cafe on a working day and settle into the old cinema seats by the window, use the wifi and write in the sunshine. 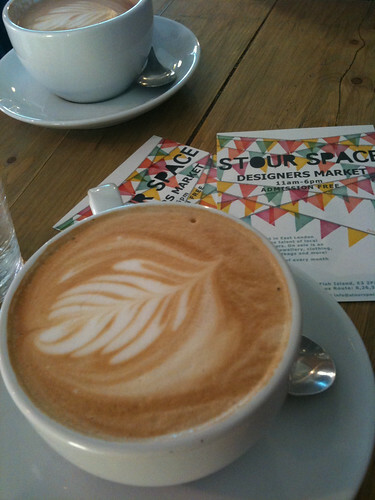 Fliers on the table directed us down to Stour Space, for their monthly Craft Fair. 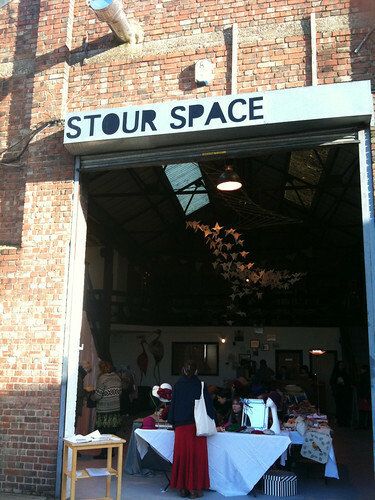 It’s an artists’ collective and studio space – super friendly people and a nice collection of designer makers. So many pretty things – sadly so many makers without websites. Grr. (How?? In this day and age? Mutter mutter </rant>). The fair is on the last Saturday of every month – certainly worth a look. 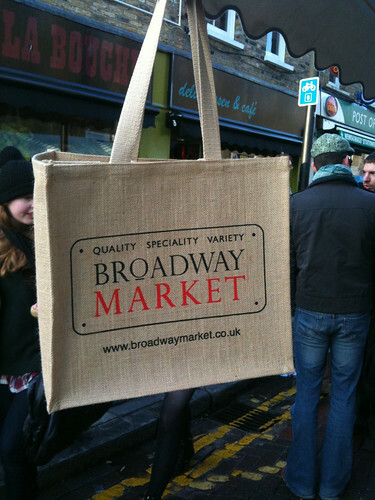 Following the canal all the way, we wandered to Broadway Market. 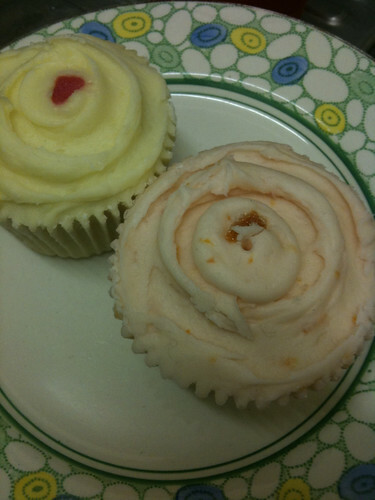 We’d been promised Hummingbird today as an afternoon sweet treat – but plans for town went out the window. So we came in search of Violet cupcakes. I have to say, I was slightly perturbed when we got home to discover that they were scattered with flecks of ‘dust or something’. I suppose we’d bought them at the end of the day. Dammit. They still tasted good – better than good. Some of the best I’ve had. Passionfruit and Blood Orange. Wonderful once tucked up at home with tea again. 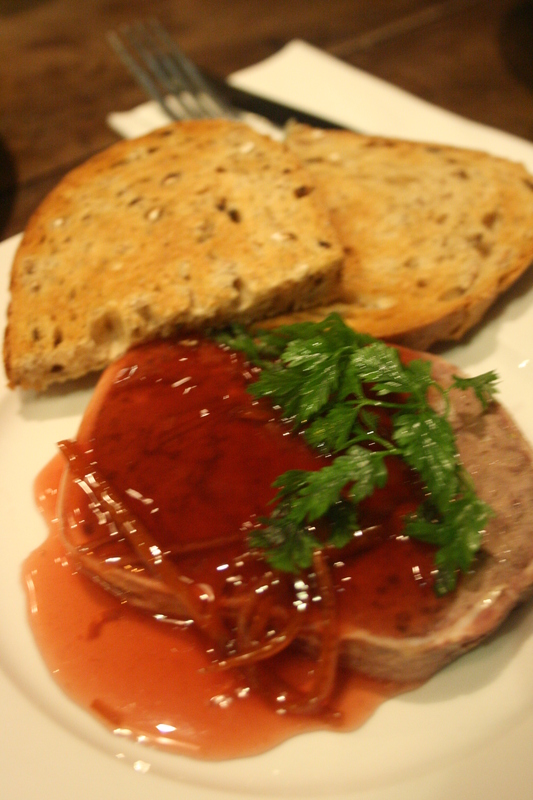 Shortly we’re off to another local Supper Club – And You Will Know Us By The Trail Of Our Bread. It’s the Evil Menu. Should we be scared? 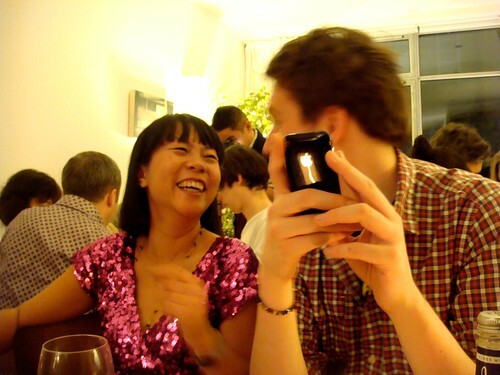 The first time I met Uyen (above) and Simon (in the kitchen when this was taken, probably) of Fernandez and Leluu, I reviewed their east London supper club for Londonist. Wooed by their enthusiasm and professionalism, and completely overcome by their food, it was a struggle to not immediately book in for the following week. And the week after that. But that’s how you get a reputation as a stalker, or so I’m told. 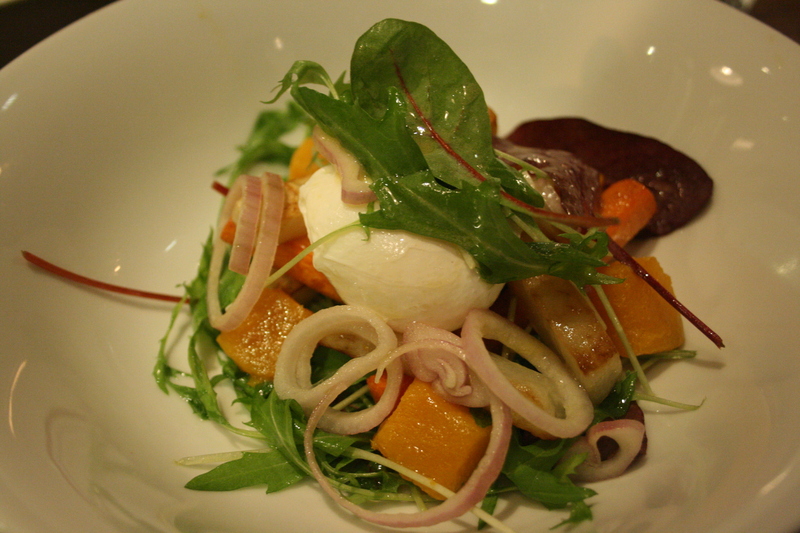 Rejina of GastroGeek who was actually there the same week, said she felt exactly the same. We went back in early December for the Miss Saigon Menu, and my personal highlight was Woven Paper rolls with Prawns, Pork, Black Fungus and Vermicelli, (Cha Gio Nem) – little crunchy parcels of prawny goodness. Coincidentally, very soon after we’d met Simon and Uyen, we started to think about New Years Eve. Rather than fight through throngs to the bar and grudgingly hand over mortgage payments as taxi fares, I was musing about cooking at home for friends. Then I remembered (a) I don’t have a dishwasher and (b) I’d seen on the F&L website that they were planning to cook that night. We spent the taxi budget on fabulous wine instead. Done! About twenty five of us spent the evening drinking, eating, laughing our heads off. Chairs had been begged, borrowed, returned to neighbours who needed them themselves, procured from others. It was great to see foodie bloggers such as the lovely Luiz in the crowd which was made up of friends of the couple and fans of the supper club. 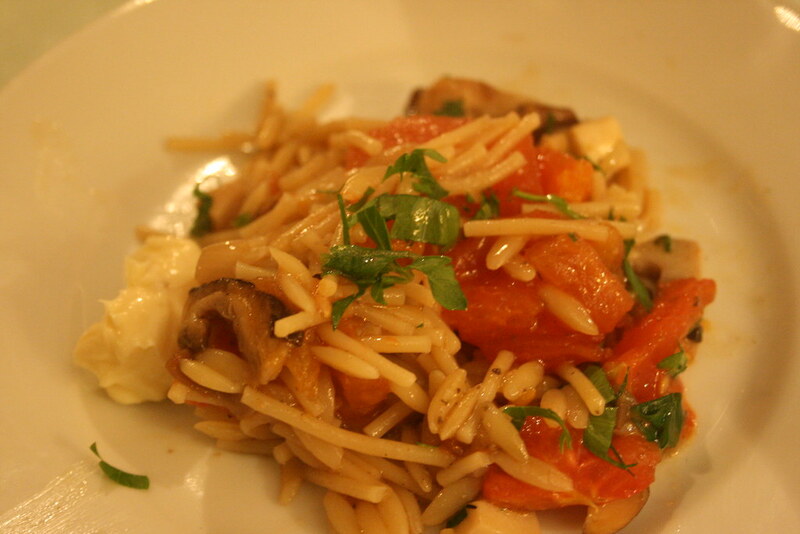 Uyen’s review and some recipes are here all I can say is – make the pesto. Our version earlier this week, devoured with Gail’s Potato and Rosemary Sourdough didn’t turn out quite as tangy as hers (I suspect she used more basil) but it was delicious all the same – such reward for so little effort, as long as you have a food processor. I was going to deny that Rejina and I polished off the lot on NYE, then I remembered hiding the wiped-clean dish in the bread basket. The sashimi was mouthwatering as always – they insist on collecting the sushi-grade fish from Steve Hatt in Islington on the day it is to be served. This is the sort of detail that makes you happy to return here again and again and we were delighted to be included in this gathering. It’s one of those places that I’m willing to give anything a try, from frogs’ legs to weasel coffee. Apparently Uyen finds it hilarious to watch my face when tasting the first mouthful of each dish, as she speeds back to the kitchen – always elated at just how good it is. 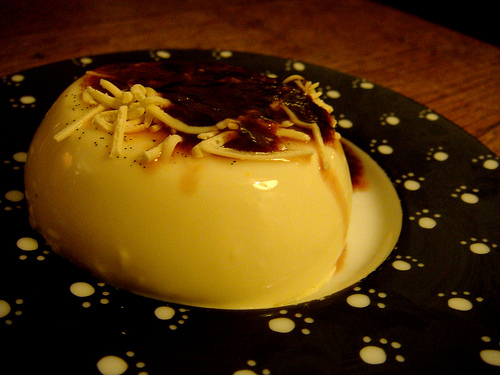 I even tried the pannacotta, which is normally the sort of texture and taste I’d run a mile from. The plate went back clean to the kitchen. Our banquet arrived just around midnight and we saw in 2010 well fed, in convivial surroundings, awash with champagne: deeply happy. 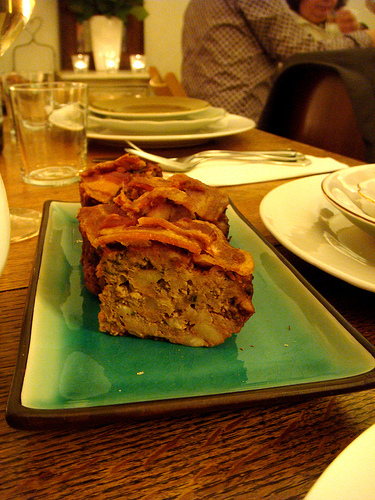 Fernandez and Leluu’s Supper Club continues into 2010 with dates on the website – some already booked out so be quick. 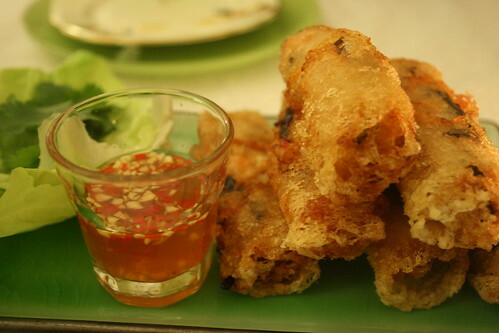 Also check for Uyen’s recipes and their reviews of London and east London foodie havens. Do you support the grow local theory? You know, less food miles, supporting community producers. I hope my local pub does, as lately I’ve been going with the ‘eat out local’ approach instead. 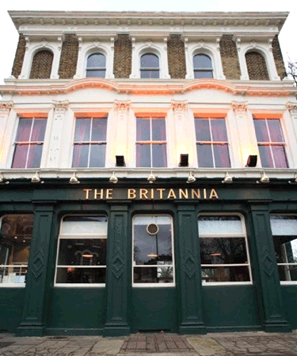 The Britannia was taken over about a year ago and changed from a dodgy old men’s pub, inhabited by squatters and terrorised by squirrels, to gasto-bistro-bugabooland. Don’t let the family-friendly policy put you off though – it’s fairly cavernous and there’s room for kids to tear about without unduly bothering anyone. Even me, with a famously low patience threshold. Only comment is that the squash could have been cooked slightly longer. Coming from a culture that boils veg into submission, this could be a personal preference. My personal highlight of the array of starters and I’ve since ordered it as a main. 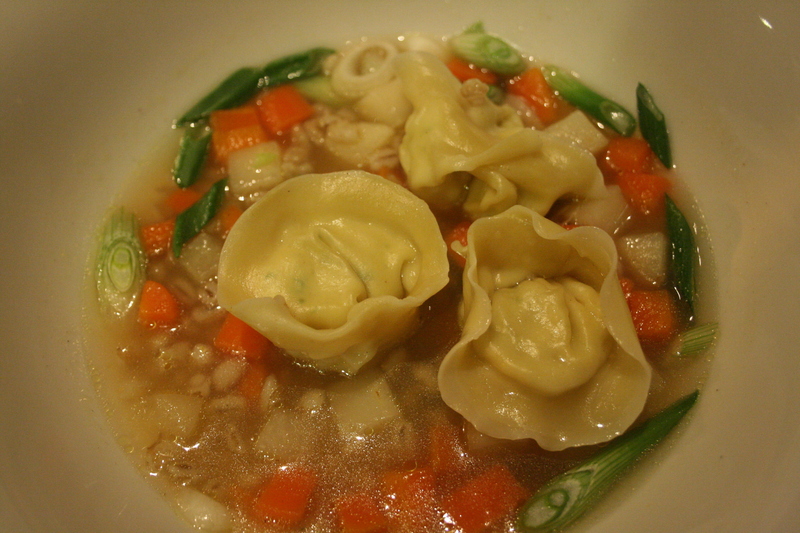 The tortellini are heavy little parcels, herby and delicious. 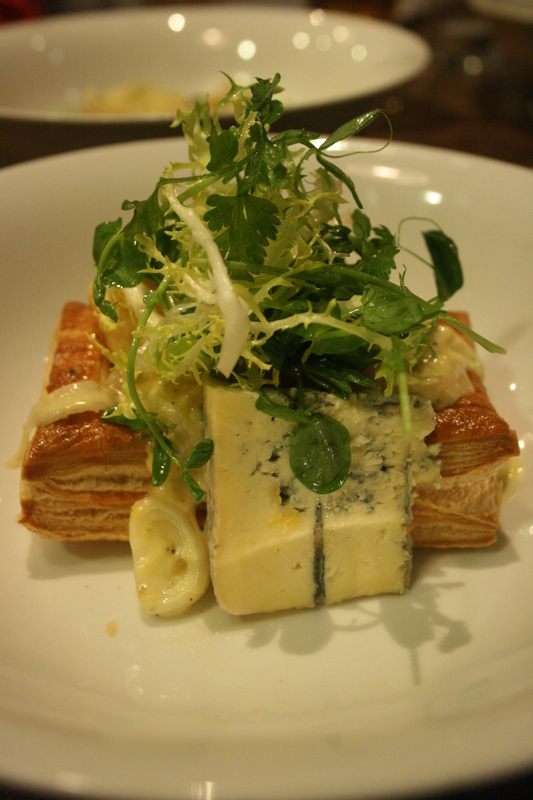 Buttery pastry and my favourite Irish blue cheese. Ok, I have no idea how many Irish blues there might be. This one is good, very good. Although it’s definitely getting better, the service is the only reason that the Britannia loses a star. They seem to juggle about with the numbers of staff, particularly at the weekends but they’re generally pretty affable. They fire up the grill at the weekend and held a series of BFI screenings during the summer. All in all – it’s everything you could want in a local.